Upland's smoked chicken with asparagus and slow-cooked spring onion. Hey, look outside. Spring has finally arrived, bringing with it New York’s annual bounty of ramps, asparagus, fiddlehead ferns, young garlic, and all those other lovely green things we’ve missed so much. While weather this winter was weird — and, well, not very wintry — it’s nevertheless been a year since any of these vegetables were at their peak of flavor. So Grub is, understandably, pretty thrilled to find them back on menus and see what chefs are doing with them this year. 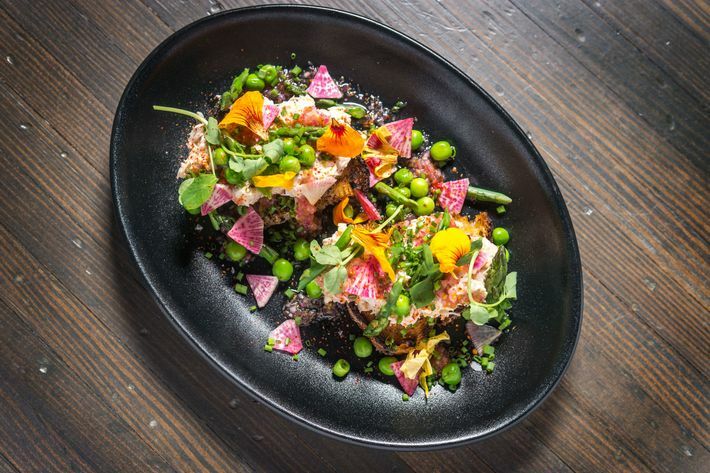 Here, 15 new dishes to get you excited about the arrival of spring. Chef Justin Smillie knows his way around a short rib, and he’s no slouch when it comes to chicken, either. 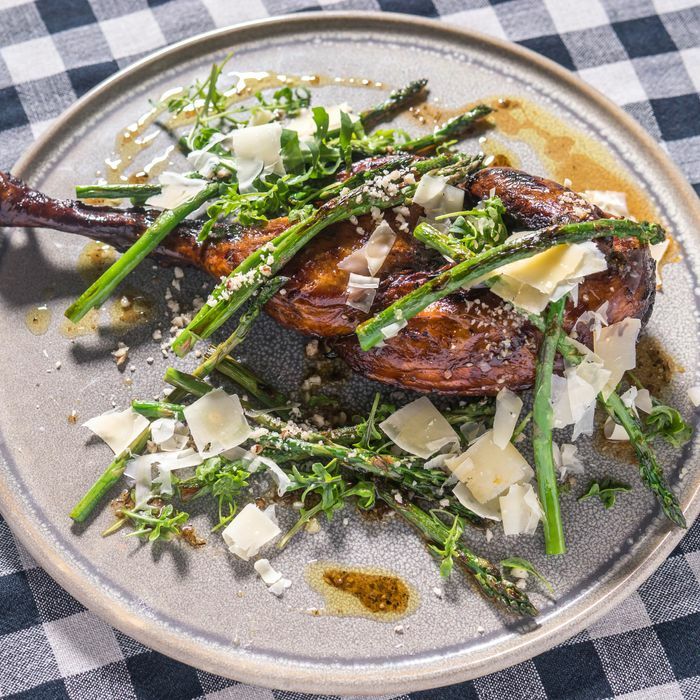 In this dish, he pairs a smoked bird with violet asparagus, Brazil nuts, and slow-cooked spring garlic. At his California-ish restaurant, sushi savant Tim Cushman hops on the cacio e pepe trend. His riff is really a salad that features thinly shaved asparagus seasoned with black pepper and sharp Pecorino cheese — and it’s an appealing one. Get your first taste of the year’s fresh fava beans at Racines. The beans are blanched, then cooked with butter and shallots and served with pan-seared red snapper, mussels cooked in white wine, a garlic croquette, and a licorice-y anise jus. Marco Canora cures pork belly for seven days, then cooks it sous-vide, presses it, and serves it over raw spring-garlic greens and roasted spring-garlic bulbs with a mustard and olive oil dressing. The Israeli-inspired spot from Cheap Eats alum Nir Mesika breaks out seared scallops with fresh morels, enoki mushrooms, and porcini mushrooms sautéed, inventively, in butter along with vanilla bean. This macaroni dish is just right for spring’s rainy days. There’s a sturdy lamb ragout, while the mint and favas add a necessary dose of brightness that will remind you warmer days are on the way. More green garlic, please. Michael Anthony pairs the verdant product with meaty maitake mushrooms — which are seared, then braised, dried, and seared again — along with frekkeh, the crunchy roasted green wheat. At this new Williamsburg spot, the kitchen serves fregola — the Sardinian couscouslike pasta — with roasted turnips, mint and parsley, pistachio-and-turnip pesto, and Parmigiano. John Fraser’s working the wok at his Union Square restaurant. Ramps feature heavily in this preparation of fried brown rice, tossed in the wok with the seasonal favorite plus spring onion, toasted nori, edamame, smoked lemongrass-infused soy, a poached egg, and shaved cured carrots. Pizza is the thing, of course, at the new Lower East Side outpost of the popular Clinton Hill pie shop, but get with the season and order the briny, sweet peekytoe-crab crostini. It’s served with asparagus, peas, and a blooming garnish of nasturtium flowers. After months of subsisting on nothing but beets and potatoes, it’s time to gorge on as much pesto as possible. Laurent Tourondel serves creamy burrata with a timely mint-basil pesto and a spring-onion vinaigrette. The East Village pizzeria goes all out with the shell pasta, serving it with ramps and morels, plus shaved fennel and nasturtium flowers. Asparagus has arrived en masse on menus, and here they use both the green and white varieties. The vegetable’s flavor gets amped up with a one-two punch of umami via miso and black garlic, plus whipped tofu. Here, pillowy sheep’s-milk gnocchi comes with brown butter and a seasonal trio of snap peas, snow peas, and mint. When you hit the barroom at Gabriel Kreuther for some of the city’s best sausages, embrace spring with this salad, which features frisée, asparagus, Affilla Cress, snap peas, and more, plus fresh goat cheese, pickled cherries, crunchy pistachio crumble, and a lemon vinaigrette.